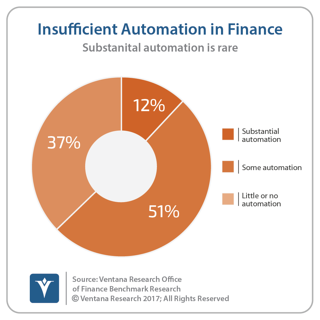 How quickly and exactly in what way a department adopts robotic finance technologies will impact the effectiveness of its CFO and the finance organization. Used appropriately, they will reduce the risk of misstatements and errors in financial statements and provide senior executives and the board with greater visibility into the health of – ­and the prospects for – the company. These technologies also will increase the efficiency of the finance department. Our Office of Finance benchmark research finds that most finance departments fit the stereotype of a reactive organization. Just 10 percent of the departments participating in the research had sufficient competence across people, process, information and technology dimensions to qualify as innovative performers – the highest level of competence and effectiveness in our assessment. By contrast, 51 percent were at the lowest tactical level. Automation clearly accelerates the accounting close. 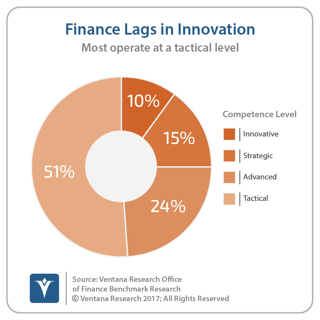 Yet our data shows that most finance departments have been slow to change, especially in adopting new technology. This reluctance persists despite the demonstrated ability of technology to improve departmental performance. For instance, our research shows that most (71%) companies that apply a substantial degree of automation to their close process can close their books within six business days compared to only 23 percent of those that apply little or none. Despite a quarter-century of agreement on the desirability of closing the books within a business week, the research finds that only 40 percent of companies complete the process within six business days. One likely reason why this is the case is that just 12 percent of companies have applied a substantial degree of automation to the process while 37 percent use little or none. Artificial intelligence and machine learning: Machine learning involves the application of data-science-derived algorithms that create the capability to “learn” and therefore improve results as more data and outcomes are observed. Artificial intelligence applies machine learning algorithms, often in a way that mimics how a human might respond to or manage a process. Combined, the two make it possible for computer systems to adapt to the needs of an organization without requiring a custom deployment process that results in a rigid implementation. Cognitive computing or cognitive systems are related to AI and ML but include a greater ability to work with unstructured data types such as text, speech, audio, static images and video. Artificial intelligence and machine learning are receiving a great deal of attention and a wide range of software vendors have been jumping on this bandwagon. The rush is warranted – because accounting is a rules-driven process demanding accuracy and consistency, AI systems will be able to automate large amounts of departmental work accurately and consistently, meaning professionals will be able to manage their operations by exception. Some applications of AI and ML such as invoice matching are already in use. Other routine accounting processes such as the automated end-to-end processing of common transactions from order to cash could be mainstream within five years, along with more rigorous testing of forecasts to identify key vulnerabilities in assumptions. So could automating what-if analyses based on historic norms as well as outlier cases to present a more analytically sound range of outcomes than the traditional base-upside-conservative triad. By 2025 some larger companies will be able to have a “first look” statutory consolidation that is more comprehensive than a soft close while falling short of a final close. Robotic process automation: In their simplest form, “robots” (actually, computer software) can automate a wide range of rote activities currently handled by individuals, for example, collecting data from multiple systems or spreadsheets and entering it into another system. Algorithmic RPA systems are more sophisticated in that they perform some analysis to determine what to do next. For example, RPA can perform some ratio analysis and choose one of five courses of action based on the result, or determine if two values are close enough that the difference isn’t material. The system, not an individual, does what people spend an awful lot of their time doing every day: making simple judgments that most of the time could be done by a machine. RPA is underutilized by finance and accounting organizations and can be used to support a continuous accounting methodology. Bots and natural language processing: A bot is an application that performs an automated task, such as handling a simple customer inquiry or searching for information. Bots that have natural language processing (NLP) capabilities facilitate human interactions with information systems by allowing users to search and ask questions using everyday written or, increasingly, spoken language. Applied to finance and accounting tasks, bots can, for example, simplify the work of clerks by finding invoices or customer master records, or provide advice on how to book certain transactions. They can give executives insights about their business without their having to do a lot of clicking around. Most software vendors have on their development roadmaps bots that use NLP. These are part of a broader trend to enhance the user experience and improve productivity. Today, the scope of capabilities of bots is relatively narrow but will widen as machine learning capabilities grow and the systems are able to deal with greater complexity and ambiguity. Blockchain Distributed Ledger Technology: Even as the uses of blockchains in commerce and government are multiplying, it’s still necessary to emphasize that blockchains don’t have to be about bitcoin and other cryptocurrencies. A year ago, I published a research note about the business potential of blockchain DLT. Increasingly people are recognizing that blockchains have substantial potential to facilitate a wide range of transactions that have nothing to do with cryptocurrencies. One key difference between blockchains designed for cryptocurrencies and those for commercial and most other purposes is that the former are unpermissioned. These have the advantage of requiring no access control and allow participants to be entirely anonymous while facilitating secure transactions that are immutable (that is, it would be extremely difficult for anyone to alter the record). On the other hand, commercial blockchains are almost always permissioned because participants are discoverable and bad actors can be sanctioned or banished. Moreover, currently permissioned blockchains also can process transactions faster with greater throughput than unpermissioned ones. One broad application of blockchain distributed ledger technology (DLT) is in “smart contracts.” These self-executing contracts have the terms of the agreement between buyer and seller written directly into lines of code that are stored in a distributed, decentralized blockchain network. Such smart contracts can replace letters of credit used in trade finance. The technology also can be applied to much of the commerce that is now handled using proprietary electronic data interchange (EDI) services. Unlike proprietary EDI networks, it’s likely that that smart contract services will be offered free or at a nominal cost. If so, use of blockchain-supported smart contracts will expand as companies are able to publish and subscribe to multiple permissioned blockchains, providing them with increased flexibility and visibility into their markets. Smart contracts can increase a company’s efficiency by automating routine purchases and sales end-to-end as well as the associated documentation and accounting. Blockchains are highly versatile, lending themselves to applications beyond smart contracts. There already is a wide range of use cases. It’s useful to think of blockchain DLT as a blank canvas that can serve as a machine-to-machine universal data connector for business-to-business transactions. For instance, in many countries financial institutions are required to follow “know your customer” protocols in setting up accounts, which is time-consuming and expensive. Moreover, having collected their customers’ personal data, banks are in danger of having this information hacked. It would be better if financial institutions could reference personal data from a blockchain distributed ledger of trusted identities. Individuals would own and control their personal data, keeping it more secure and saving institutions and themselves considerable time and effort in establishing an account. Cargill recently experimented with a food provenance blockchain that provides consumers with information about where the turkey they purchased was raised and how it got to their table, including photos as well as comments from the farmers. The age of robotic finance is upon us. The technology is already in use but has considerable room for growth in capabilities and ease of use. Finance organizations will find that these technologies will enable them to realize the longstanding objective of becoming primarily a forward-looking engaged advisor to the rest of the organization. 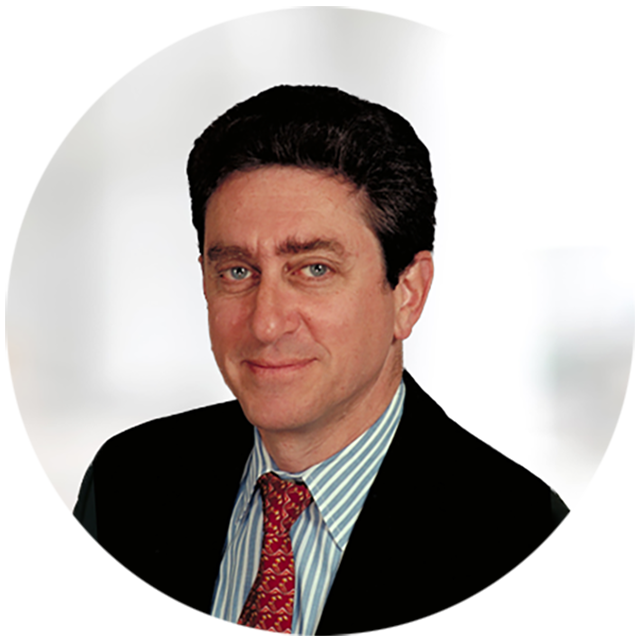 Of course, CFOs will need to cast a skeptical eye to claims by visionaries and vendors. But they also should recall the example of the internet, which went from nothing to a pervasive part of commerce and enterprise computing in a few short years. At the very least, they will do well to be prepared to be fast followers as these technologies evolve rapidly and demonstrate practical value. Come learn more at my 2018 webcast On January 18th at 11am PDT called Robotic Finance. Register Now.